Are great leaders born or made? 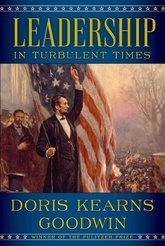 In this culmination of five decades of studies in presidential history, Pulitzer Prize-winning author Doris Kearns Goodwin draws upon the four presidents she has examined most closely—Abraham Lincoln, Theodore Roosevelt, Franklin D. Roosevelt, and Lyndon B. Johnson—to offer an illuminating exploration of the development, growth, and exercise of leadership. Although different in background, ability, and temperament, these men shared fierce ambition and deep-seated resilience. At their best, all were guided by a sense of moral purpose. At moments of crisis, they were able to summon their greatest strengths. This watershed work offers bold new insights and an inspiring road map for leaders in any age.